In a villa in Florida, a woman with violet eyes dreams of an ancient document. In a hotel room in Las Vegas, a renowned historian who claims to have found the sword Excalibur dies a violent death at the hands of one-eyed man. In London, a treasure hunter sets out to find the sword that cannot be and the resting place of the king who could not exist. Powerful forces are at work breathing life into the legend. At long last Excalibur is rising. Now I know that I have mentioned my love for all things King Arthur/Camelot in past blogs. 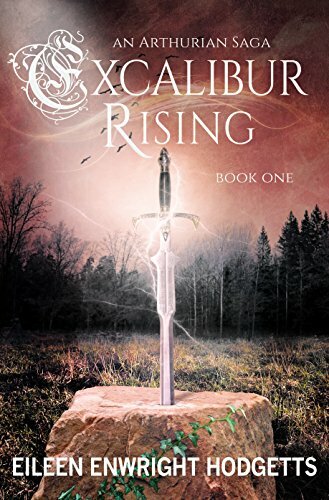 I can’t read enough about it and when Eileen approached me to review Excalibur Rising, I pounced on it after reading the blurb. I am glad I did because this book is not what I thought it was going to be. I thought it was going to be a love story with some action mixed in. Instead, what I got was a book that was definitely not a romance. If I had to classify it, I would say that it was more like Angels and Demons except thrown in a whole fantasy element and a dash of romance along with the intrigue and adventure. The book starts off with Marcus Ryan, a professor of archeology who used to be a star on his own syndicated TV show. He is now a has been and is working for a mob boss verifying different artifacts that come through his hotel. Honestly, I didn’t like him at first. He just rubbed me the wrong way. He came off as an irresponsible, selfish man who only cared for himself. The scene where he justified to himself why he did certain things (like not having a relationship with or supporting his wife and daughters) made me dislike him even more. He also could not stick up for himself and if he did, people ignored him when he did stick up for himself and he just went along with what people planned. Which is how he ended up with a chalice, a paper and a piece of crystal that was given to him by his mentor before the mentor died. The chalice, paper and the piece of crystal were clues to finding Excalibur. Violet Chambray was a very interesting character to read. When she was first introduced into the story, she was somewhat of a con artist. I say somewhat because she can see images from objects that she touches and she has visions but she chooses to use her gifts for her own gain. She knows nothing of her past….except that she was left at an orphanage in France and at an early age. She saw something on that piece of paper that made Ryan’s mobster boss take her with them. What she saw, though, revealed clues to her past and to where Excalibur could be. What I really liked about this story is that the author chose to explore the myth that Arthur was sleeping instead of waiting to be resurrected by Merlin. Every angle of the Arthurian myth discussed and basically disproved…..except for the Arthur is sleeping myth. I also liked how the two main storylines (the dam being built along with Ryan’s search for Excalibur) were woven together pretty early in the story. The sense of urgency that showed up when Ryan and company were in England became even more pronounced once the sluice gates to the dam opened up. The end of the book was very anticlimactic and it definitely left an opening for book 2. Which I can’t wait to read because I need to find out what happens to certain characters!! Why: A great take on the King Arthur myth. The plot was fast and the characters were engaging. I couldn’t read this book fast enough. Your site is very charming and your thinking is very touching. Thanks for your good post and wait for your next one.